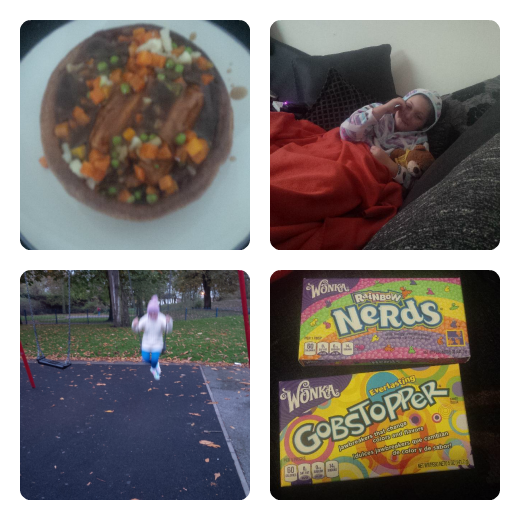 I took this half term off work to spend some time with Olivia. With going back to work full time I thought it would be nice to have the whole week to ourselves. I was looking forward to lazy days on the sofa, lie ins, and lots of channel hopping. Olivia, as usual had other ideas but I won out in the end, kind of and a lazy week it was. I slept in till 11am!!!!OMG! Amazing! Olivia had been at her dads and just came home for a few hours before going back as she was going to the Welsh Mountain Zoo with her dads mum Nanny B.
Olivia went to the Zoo whilst I nipped to the shops for a bit of window shopping before spending the day comping, boy have I missed that! Olivia was looking a bit peaky due to walking round the zoo in the rain! So it was a sofa day. Warm bath and comfort food. Feeling better we hit the park before time to work off our massive lunch of giant yorkie pud, sausage, mash, peas and gravy! Then it was off to the sisters to carve our first ever pumpkin and what an evil looking one we ended up with too. Thursday saw my nieces come round for some pre halloween arts and crafts. They came, they glued, they painted, and stitched. They also left me a huge mess in the kitchen too! Kids hey! PayDay!!! Whoop whoop! We headed out for a subway breakfast before getting the last of our halloween bits before coming home to transform Olivia into a wicked bat queen to go trick or treating. 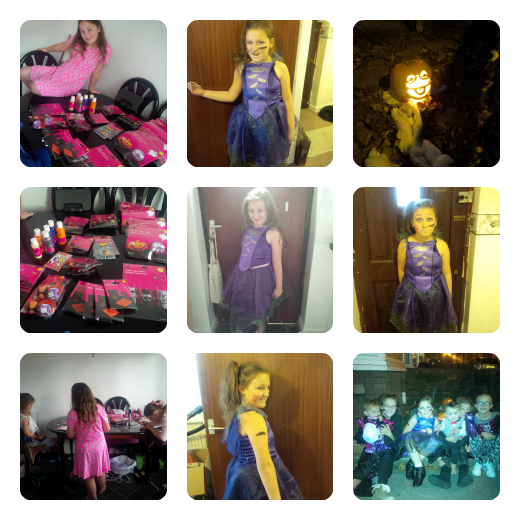 We had a big party for the kids and they had a ball giving sweets out to the kids who came trick or treating before heading off out themselves. Such a fun night and all our pumpkins were a bit hit with everyone who stopped by. Gym day today before Olivia headed off to spend the day with her dad leaving to do some more comping (expecting some big wins this month!) and the rest was spent on the sofa pretty uneventful to be honest. Today is being spent in pjs eating the rest of the halloween haul with cheese toasties for lunch and chicken casserole for dinner watching the parent trap. So there we have it, our pretty uneventful half term also to be seen below in pictures enjoy! Next Pink for Girls, Blue for Boys?